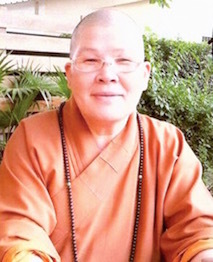 Dharma Teacher Che Zong was born in 1949 in Beizeng Village, Tianwei Township, Changhua Country, Taiwan. As her father was sick for many years, her family had a hard life. So, she deeply felt that suffering prevailed over joy in human life. At the age of 12, she started to think of renouncing family for a monastic life even though she had not come into contact with any Buddhist environment. • In 1969, she was tonsured by Bhikkhuni Master Chang Yuan at Gushan Temple, Tianzhong Township, Changhua Country, and entitled Che Zong. She studied in Chunghwa College at Wanfo Temple, Taichung. In 1976, she received full precepts from the Dual-Sangha ordination at Longhu Nunnery, Dagangshan, Kaohsiung. • In 1979, she founded Xinche Temple in a mango orchard at Caoya,Kaosiung. • In 1982, she started to serve as Abbess of Birui Temple, Ziguan, Kaohsiung. • In 1983, she founded Lotus Pond Charity Society at Nanzheng 2nd Road, Wujia, Kaohsiung for Xinche Temple. • From December 25, 1990 until May 1994, she served as the Abbess of Leiyin Temple, Ling Mountain, Meinong, Kaohsiung. • In July 1995, she rebuilt and inaugurated Xinche Temple at Baotai Road. Being reared in a poor family, she has harbored a compassionate mind. Thus, she has been able to be more sympathetic to people in need. Being unable to receive schooling as a child, she has been very eager to cultivate children and youth. Therefore, she has given her full efforts to promoting social welfare charity work, and various cultural and educational activities to protect the Sangha and Dharma of the Three Jewels. Taiwan Xinche Lotus Pond Charity Society In order to continue the Buddha’s compassion by benefiting humankind, Dharma Teacher Che Zong founded the society so that the “temple” might serve as a cornerstone of faith and wisdom cultivation and thus maintain her Dharma lineage. Also, she wanted “society” to increase its merits and blessings, benefit society, and inspire more people to join the good cause. The society is classified into five volunteer teams respectively led by its directors or supervisors to provide care and aid: 1. Medical Team, 2. Child Guidance Team, 3. Foreign Spouses’ Care Team, 4. Chanting Assistance, and 5. Activity Support Team. Current Posts: 1. Standing Mentor at Taiwan Xinche Lotus Pond Charity Society 2. Supervisor of The Buddhist Association of China 3. Director of The Buddhist Association of Taiwan 4. Director of The Chinese Buddhist Bhikkhuni Association 5. Managing Director of the Buddhist Association of Kaohsiung 6. Standing Committee Member of Dagangshan Dharma Lineage Association This is a Humanistic Buddhism practice field where we must learn, understand and carry out Buddhism, constantly develop blessings and wisdom, and realize the theory in the practice. We should shoulder the responsibilities to deliver living beings from suffering and to prevent Buddhism from decaying, and take on the missions of purifying human minds and society, and spread the seeds of great love. Sincerely, we invite all of you to join us in striving jointly to turn this piece of land into a big home in peace and harmony.